Nintendo GameBoy Color - Teal - Gaming Console Excellent! Home / Nintendo GameBoy Color - Teal - Gaming Console Excellent! Good shape, original Nintendo! Works perfectly. 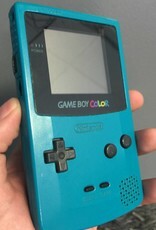 Original Nintendo Gameboy Color! Console will have small scuffs on the screen, and edges. Fully tested! Hard to find Teal color! Takes TWO AA Batteries. Not included.